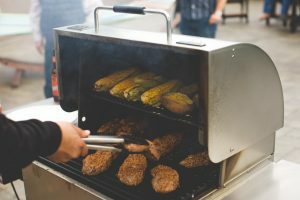 Everyone knows that grilled meats are the star of the show, but it’s important not to forget that your MAK grill is capable of cooking up all sorts of other non-meat related delicacies. Grilled veggies make the perfect side dish or even main course (for all those vegetarians out there). Also, for those who are more religious, we know that lent starts on March 6th and also requires cutting meat out of your diet. In order to allow those people to participate and simply because vegetables are the bomb, we’ve decided to dedicate this month to a different food group! Click Here to Submit Your Recipe! To kick things off, we’ve provided you with one of our favorite veggie recipes. A special MAK twist on a classic baked potato recipe. Hopefully, this will help get those creative juices flowing. We can’t wait to see everyone’s creations! Wash potatoes and towel pat dry. With a knife, cut a lengthwise slit in the potato approx. ¼” from each end and about 1” deep. Lightly coat each potato with oil. Lay a square of foil slightly larger than the size of the potato on the counter. Sprinkle the rub onto the foil. Roll the potato over the rub to coat the entire surface thoroughly. Wrap the potato in the foil. With the FlameZone™ cover in place, start the grill and adjust the setpoint temperature to 350°F. Allow time for the grill to preheat. Place the potatoes near the center of the cooking grate and cook for approximately 60 minutes. Add a little butter, cheese, sour cream, bacon bits or some of your other favorite toppings then serve!